This welcoming floor plan, featuring all of the space you could possibly need, is truly something you must see to believe! This home features a space for your dining room table immediately to your left upon entry, and an oversized sunken family room with plenty of room for not only comfortable living - but entertainment space as well! The kitchen contains solid wood cabinetry, granite counters, and a gorgeous glass tile backsplash - along with pendant lights and stainless steel appliances that remain with the home. Your inside laundry room features cabinets, a sink, and easy access to your huge garage. Back inside, you will find three bedrooms, including a large master with en suite bath. There is also a full bath available for the secondary bedrooms. Both the master and secondary bath have double vanities with marble counters and updated cabinets - and the tile work in both bathrooms is FABULOUS! Continuing into the backyard, you will notice it is fully fenced and has plenty of space. There is a screened in patio for those evenings spent enjoying nature (seller will be replacing screen prior to closing). 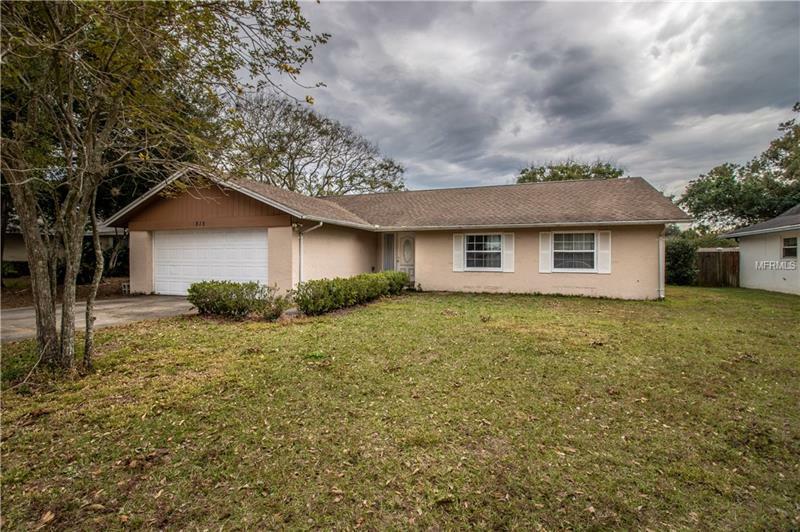 This home is located in an established neighborhood, with no HOA or CDD. Less maintenance for you as well - this home had new windows and AC done in 2013 (along with complete interior renovations), and was replumbed in 2016. All that is left for you to do is make it yours!! !